Jenny Torres Sanchez lives in Florida with her husband and children where she currently writes full time. Before her debut novel The Downside of Being Charlie she taught high school for several years, where she credits her eclectic students for inspiring her to write young adult novels. Because it expresses the human experience. Because through I think story is the best way to expresses human emotion and struggle. It connects all of us, let’s us know, yes, others feel this way. Others think these things. Others know this feeling. I think I’d have to say my favorite all-time book is The Book Thief—I remember reading the last lines of that book and taking a deep breath and thinking, “This is the most beautiful book I’ve ever read.” I cried so much while I read that book. I think Zusak was a genius in how he was able to portray so much hope, and love, and pain, and loss, and hate, and friendship and wow, just every feeling on the spectrum of human experience in this one book. Truly amazing. Favorite outside my genre, probably The Stranger by Albert Camus. I think it’d have to be from Stephen King, from his book On Writing. Basically, he said write. If you want to write, then sit down and do it. In your new book; Death, Dickinson, and the Demented Life of Frenchie Garcia, can you tell my Book Nerd community a little about it and why they should read your novel? This novel follows Frenchie Garcia as she tries to deal with the death of Andy Cooper, her long time crush. By chance, or fate, she runs into him one strange night and he suggests they have one “cool night” together, going on different adventures. It’s set in Orlando, so they go to Lake Eola, they philosophize about the swans, they go to a tattoo parlor and a couple of clubs downtown, they make the drive out to Cocoa beach, and lastly, they visit Greenwood cemetery. The next morning, Frenchie is full of hope and the possibility of what that night meant, what might be, when she receives news that Andy Cooper is dead. He has committed suicide. I think readers should read this book because I think a lot of us are like Frenchie, a lot more vulnerable and confused and hurt than we want to let on. And like Frenchie, I think there is a way for us to come to terms with and make sense of it somehow. What part of Colin did you enjoy writing the most? I think I most enjoyed writing Colin’s compassion and understanding. His willingness to help Frenchie and comply with her strange requests without much question and mostly because he felt she needed a friend. For those who are unfamiliar with Frenchie, how would you introduce her? Seemingly unapproachable, but incredibly sensitive. Right now I think I’d like to introduce Frenchie to James Whitman from Dr. Bird’s Advice for Sad Poets because they both have a thing for dead poets and words help them deal with the overwhelming things they have going on in their lives. Ha, there’s no good way to answer this. Well, um . . . honestly I don’t know. I hate lying, so I make it a point not to. I’d have to say if you ask me something, you’re likely to get a pretty honest answer. Oh, this really terrible job I had at the airport. I was a line server at a buffet/restaurant and had to wear checkered pants and a chef’s hat and serve food to pissed off tourists that sometimes didn’t know they were about to pay 5 bucks for half a chicken nugget. I got yelled at a lot by customers for the prices. A lot. My first boyfriend was a guy named Jon. He was pretty cool, but looking back now, I’m kind of surprised at how very little he knew about me. Ugh, do I have to? I’m not a mushy type of girl at all, but here goes. It was in the school hallway and it was rushed and horrible and not at all what I thought a first kiss would be like. Also, I totally got caught by one of my teachers who yelled at me and later that day, I had her class and was completely embarrassed. The last time I cried was because my dog pooped all over the house and I had to clean it up and I’m seven months pregnant and on a bit of a deadline and Frenchie was being released in a couple of days and I had some events coming up and was feeling anxious over them because I’m not a great public speaker and was just in general overwhelmed, so I called up my husband and did the whole blah, blah, blah, sniff, sniff, sniff, everybody hurts deal over the phone. But I cry and get choked up over lots of little things. If I see a kid walking to school, it can totally make me think a thousand different things and I end up crying by myself in the car. By the time you post this interview, I probably cried earlier over a dead bug. True love with heartbreak. Love can inspire some great stories. And sometimes heartbreak can inspire even better ones. The 80’s. I mean, I’m kind of this hybrid 80’s 90’s kid, but I was in elementary school during the 80’s so technically I wasn’t a teenager. But I would liked to have been. The 80’s were a cool era for music and I would like to have gone to more of those concerts. Frenchie Garcia can’t come to grips with the death of Andy Cooper. Her friends didn’t know she had a crush him. And they don’t know she was the last person with him before he committed suicide. But Frenchie’s biggest concern is how she blindly helped him die that night. Frenchie’s already insane obsession with death and Emily Dickinson won’t help her understand the role she played during Andy’s “one night of adventure.” But when she meets Colin, she may have found the perfect opportunity to recreate that night. While exploring the emotional depth of loss and transition to adulthood, Sanchez’s sharp humor and clever observations bring forth a richly developed voice. 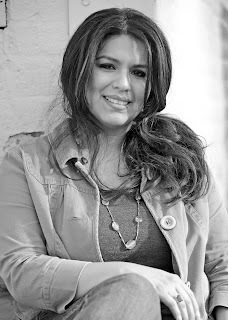 Jenny Torres Sanchez’s Death, Dickinson, and the Demented Life of Frenchie Garcia is the detailed rendering of a young person’s grief. For Frenchie Garcia, she’s always been that person in high school who is a bit different from everyone else. She certainly portrayed a dark but unique individuality. She’s fully artistic and there was something mysterious about her. When a night that started off as exhilarating ended up being horrifying, author Jenny weaves a clever and unique story that shows that even the dark and mysterious Frenchie is like any regular girl trying to deal with some very heavy emotions. Although Emily Dickinson’s name is within the title of the book, there’s no need to worry about missing out key points of the story if you don’t know anything about her. There are mentions of Dickinson’s work in the book but remains to be outside of the focal point. Dickinson was cleverly used as a friend to Frenchie. This is certainly one of those books that play with your heart and feelings. The story’s direction to detail Frenchie’s accounts on handling a death, particularly the suicide of Andy, was well-written. The writing is able to carry readers in a fully-engaging way that it was easy to comprehend how Frenchie was able to pull herself out of a dark and depressing place. The relationship between Frenchie and Colin is full of honesty and it was amazing to read how Frenchie tried to recreate that eventful night with Colin. I felt immersing myself in each moment as Frenchie was, trying to dissever that fateful night to see why Andy had taken his life. Just like an amazing book that seems rather depressing throughout, Jenny’s amazing writing is able to convey the story and reminds readers that through the dark tunnel, there’s always a light at the other end. It is filled with an interesting outlook at how one person is trying to sort things out that had powerful impacts in their lives. Frenchie’s grief and her journey to overcome it are very touching. Her story is identifiable, especially to anyone who has lost someone close. 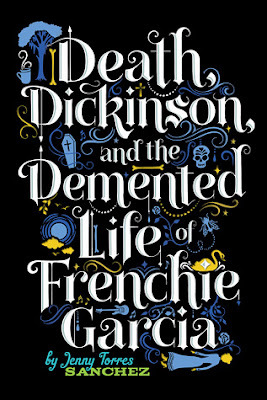 Jenny’s Death, Dickinson and the Demented Life of Frenchie Garcia is an amazing story that takes a very sensitive and moving subject, and transform it into a beautiful story that will appeal to readers. Thank you Jenny for making this giveaway possible. of Frenchie Garcia by Jenny Torres Sanchez. 1 Winner will receive a Poster and Bookmark of a Surprise Art by James Vallesteros. 10 Winners will receive One bookmark of a Surprise Art by James Vallesteros. Great interview. Her book sounds interesting too :) Thanks for the giveaway. That was a really awesome interview. Love the book already. Awesome interview and thank you for the giveaway!